We're at that point in the season where all our 2017 electric bikes are coming into stock. 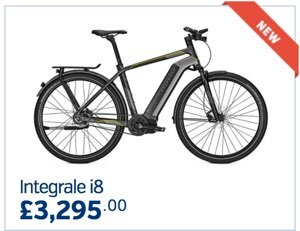 We now have the following 2017 Kalkhoff electric bikes in stock in our warehouse and showrooms, along with 2017 models from Scott, Cube & Haibike. Melanie Reid writes in today's Times about how electric bikes are emerging as a favourite gift this Christmas. "When things come in clusters, you know you have a trend on your hands. Randomly, at least three girlfriends have announced they want an electric bike for Christmas." The Cycle Show 2016 is now in full swing at the Birmingham NEC. We attended our first Cycle Show in London back in 2004 with a somewhat home-made stand. It was actually a great success for us at a time when electric bikes weren't even really a niche product. Today they're an established and growing segment of the bicycle market and our early start means we're still leading the way. We're exhibiting at the Cycle Show 2016 at Birmingham's NEC and we're bringing more bikes to see and test ride than ever before.